Everything the Play Store does with the apps on your phone goes through Google Play Services. This tells your phone when to update apps and introduces new features and settings to Google Play. Long story short: you should keep it updated. 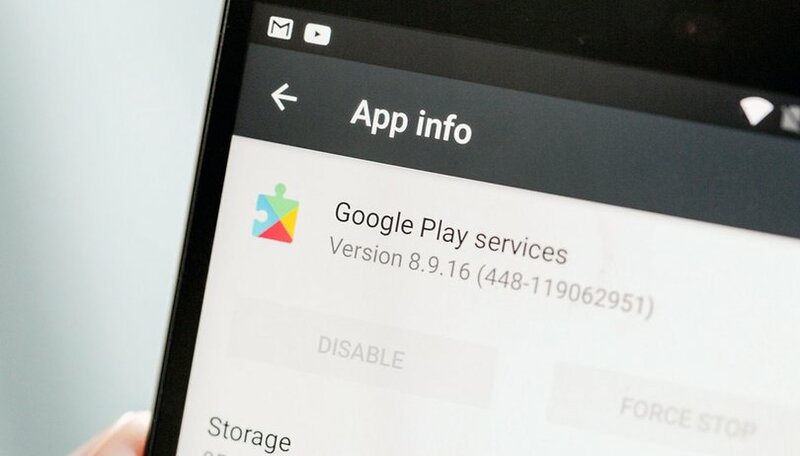 Find out how to check the latest version of Google Play Services, and how to update Google Play Services the easy way or the more technical way with a newer APK. Google Play Services: what is it and what is it for? Google Play Services is an application that very closely linked to the Android system itself that allows your smartphone to benefit from the latest versions of applications and security patches without upgrading to the latest version of Android. Despite the confusing names, this is distinct from the Google Play Store where one can access, buy, and download media such as apps and games. Google Play Services latest version: what's new? You can check out the changelogs for the the latest version of Google Play Services here, and also view the timelines and logs for earlier releases. Most of what the updates do are small changes under the hood such as streamlining aspects relating to ads, games, fitness etc., and making the overall Google ecosystem operation more efficient and stable. Keeping Google Play Services up-to-date is beneficial for all users, even the most casual ones, as the improved efficiency it brings will save battery life and improve offline services. The simplest way to always have the latest version of Google Play Services installed is to keep an eye on this page, where we'll provide you with a download link to the very latest versions available in the Play Store. Just tap the install button below to ensure you have the current version. However, as with most things Android, there are always newer and better versions available if you're willing to put in a little more effort. For example, there are multiple versions of Google Play Services for the different versions of Android you might have. So, if you want the very latest version, just follow the steps below. Users who want to make absolutely sure they have the latest updates, or want to access a beta or test different versions of Google Play Services, might want to use a more technical method. This can be useful for app developers, or for anyone who is suffering from a software error that blocks Google Play Services from updating normally. First, you'll need to know which version of Android you have. Then, you'll need to check which apps are allowed to install from unknown sources. Go to Settings and then Apps. Find the app, which you will be installing from - usually your mobile browser or a file explorer. Tap on it. Scroll down until you see the Advanced section. There you should find Install unknown apps. Tap on it and tick Allow from this source. Next, you need to know which version of Play Services is right for you. This is where your Android version number comes in. Each Google Play Services version has a three number suffix at the end, following the hyphen. These three numbers are broken down as follows: Android version, CPU architecture and dots per inch (DPI). You can check the current version of Google Play Services by going to Settings > Apps > All tab > Google Play Services. So in the screenshot above you can tell I have a Lollipop device running an ARMv8 chip with 320 DPI. If you want to do things the other way around and figure out which number you should be looking for, just grab CPU-Z, which will tell you your CPU architecture and DPI. The good news is that once you know this information it won't change until you get a new phone. Now you simply have to choose the right Google Play Services version based on the three pieces of information you just collected. You can find the latest versions of Google Play Services hosted on APK Mirror and select the right one with the right suffix for your device. Then, just download and install Google Play Services onto your phone. Did you find this guide useful? Any tips or information you think we missed out on? Let us know in the comments! Didn't an updated play service within the last month have a bug, that screwed up the play store or google pay? Any suggestion will be appreciated..
Did not work for me on my tablet as I have 9 figures after the hyphen. This "technical way" worked for me. MotoG, android5.1. Once I had got an uncorrupted version of the Google Play Services from the mirror and downloaded the CPU-Z program, the whole reinstallation went on automatically and saved me a lot of time. Thanks. Just checked my Google play services version and I currently have 11.3.02. I'm guessing that what version IDs on your device is dependent on what OS version you're running. To all those who have tried to download the latest version, if you are in anyway unsure or are not confident about how to ensure you have the correct version, then do not proceed. The app will be updated to the latest version automatically via the Google Play Store. You run the risk of having major problems with the wrong version being used. Only carry out additional features if you are confident about what you are doing. I found that I had to install the google services app to my phones system app folder or I got an error 0 message and wasn't able to download!! You need a root file explorer that can install the apk to the phones folder to do so! I used ES file explorer. I had root deleted the app. ...actually I think I just moved the apk and the phone installed it automatically. Thank you (is it Scott?). After deleting my Google Services in an attempt to get an app installed, numbnuts Samsung rep told me I would have to do a factory reset on my phone. Your instructions worked perfectly, the first time. My phone is Galaxy 2, SGH-T989. I am grateful. H E L L O , Moto G (1st generation) XT1032 Lollipop 5.1 . . .
"Android is starting... Optimising app 14 of 52". I succeed in accessing "Recovery" and I have carried out "wipe data/factory reset" 3 (or more) times. On "Reboot" the Moto logo appears. After a long wait I get a dark screen and the "Android is starting... Optimising app 1 of 52" starts all over again . . . what is your advice ? . . . If 8 as the first number means android TV then why does my marshmallow device have 8? Intex Aqua with Version 5.1, not able to update any app. Hi, I am sorry , I might be a bit stupid. I got the 3 numbers thing, my number is 248 but what about the version?. By deduction I took the version from the time I got my phone November 2015 but I am not sure if it worked. I installed an app, APK Installer, to install the file I downloaded but still having problems with google. Google app does not work and most of the apps tell me they are not supported by the phone cause is not compatible with Google Play Services. I am desperate, I rooted my phone and I thought it would work properly and I still have this problems...Is there anything I am doing wrong? Maybe the version? So, I have a fire tablet hd 7, and I would like to know if it would be smart to download this? I got Snap chat off of an online app store, and it needs Google Play services to run. Thank you! Please Reset And Install Google Updated Play Store Free. Using Sony Xperia J ST26i (Andorid version 4.1.2) - rooted phone and unstalled playstore anf google app accidently. Which Play store version need to install it? You shouldn't manually update Google Play Services: chances are that Google apps (and some other that use Google Play Services) will crash. To resolve this, the only solution is to factory reset. It's what I had to do although I verified which version was the right one for my phone"
Please Factory Reset Androids Latest Android Version Of Google Play Store Free. Hi i just update my Samsung note 3 today 17/07/16. I can't open my Gmail and i get a message that Google play service update, I redirected tl tbe the page. but am informed that my device (Samsung Galaxy Note 3) does not support this version. I have gone through your instructions. My google services version is 3.2.25 (761454-30) so I am at a loss to decide which version apk to download. Can you help me please? Please help me. Gmail wont open because I get a message to update Google Play Services. I am redirected to update page but am informed that my device (Samsung Galaxy Note 3) does not support this version. I have gone through your instructions. My google services version is 3.2.25 (761454-30) so I am at a loss to decide which version apk to download. Can you help me please? I got a new prototype tablet based on mt8783 chipset from China factory that does not have play store. The factory said there is no official android for that chipset yet from Google. Google play or even Google play services do not install. So I cannot add Google account or run gmail or youtube app. Is there a solution for that? Big thanks to the Androidpit.com. This page is very useful. It helps me to fix my phone once I lost my Google Play Services. Reading through its instruction carefully, and I was led to a download page. Then I got a right thing there. To this stuff, I have been spending a week to search for. And it will never be provided by any mobile phone service center too. When I brought my crashed mobile phone to my service and confessed them I had uninstalled the Google Play Services by mistake, they never thought twice on how to fix it. I was simply given an answer that the phone needed to be hard reset. Can you helped me. Thank you. I started using my nexus 5 again and after updating to v 5.1 I found that I had authentication problems with my google accounts registered on that phone so I logged back into my main gmail account and found that I am able to download from the playstore but could not update google play music or go to my pictures without needing to update google play services. Every time I am redirected to the page to update it I am asked to sign in and when I hit the button it reloads the same error message. I cannot log out to see if i can reset it and when I tried to follow the directions here I am brought back to the heart of my problem - I still need to be able to log in. Please help! This article is a bad idea: never manually update Google Play Services. It will update itself with no trouble. If you do it manually, there is a big risk to see all your google apps (gmail, play store, google keep,...) crashing. I insalled Version 8.7.03, my phone is on this level also up to date now. Just now recieving Android 6.0 on my Moto E second Gen. LTE in Europe and i am verry pleased with my Moto E.
hi! I just bought a meizu mx5 from china, and I receid a chinese version and I try to install google play and the others google services and is impossible..
anyone has the same problem? What can I do? I can download some apps from ""the other app service from china "" but I need youtube, gmail, wallapop, maps.. etc..
My Lenovo phone keeps popping up messages of google play services has stopped working. How to fixed it? Please any suggestions. My Google Play Services stopped working. Can't access emails and apps. Advice pl. Hello Kris tell me. .
Hey i want to know about a custom app which is supporatable to my device Lenovo vibe p1 that can lock other apps using fingerprint sensor i tried many apps but none of them are supporatable to my device. No rush, will wait and get it when it is rolled to my region. Thanks for the information. Cooee Messenger- Messaging into the future! Think this will work with Amazon's new Fire tablet? I honestly don't understand any of those info.. I check my phone (Nokia XL) and it shows 036 at the end of the parenthesis.. Now how will I choose the correct APK to update Google Services? Extremely poorly written and researched "guide". My phone does not show DPI, even in CPU Z, there are two values for DPI, not just one. The cpu architecture is not one of those listed and the guide makes no effort to acknowledge this possibility. Useless. Anyone have experience with the horrid galaxy centura that can help me get play services installed? So, the info given above shows us which version of Play Services is the right one for our devices. Now, my Nexus 4 would need version "...-236", but on the download page there's -234 and it jumps directly to -238. "4" means 240 dpi and the "8" means 480 dpi. My device has 318 ppi, but there's no -236 version there. Does anyone have any idea why is that? Mine was 438 and went to 238. So my number version changed the first number not the 3rd one. I'm guessing each phone maybe different. How I ended up figuring it out was googling what I needed for the phone and the model of it. Believe me it was not an overnight task. But I am cautious. apkmirror.com/apk/google-inc/google-play-services/google-play-services-8-1-05-2218116-238-android-apk-download/ Try this link maybe this one might help oh since I am new the link would have to have the http and www in front of what I posted. I got rejected because I am new and thought I was showing spam. You should be able to use version 230 and the 0 is universal. My previous version was 430 and I installed 230 which worked. I think the universal option is for phones with a DPI that it not covered by the other versions. Am new to this.. followed all instr (Moto G V1, Google play Serv Ver 7.8.99 [213422-036]...) want to go to Sep2,15 update Ver 8.105 [2218116-036]... but Google play says I have have it installed and stops me from adding it. So... what I am I doing wrong? What I had to do was give it permission in security I unchecked to download third party app. Since it isn't coming directly through Google play but from someone else. I am not familiar with your phone so it may differ how to do this from phone to phone. The new version of google play services helped my problem with my in app maps from crashing. Thank you. I was about to have my phone reverted to KitKat, except I really love the features of Lollipop 5.0. Thanks again. Happy me, happy phone. Why can't we get these updates on Google PlayStore ??? why we have to download it from other sites !! You do actually get these automatically from Google, but there are those amongst us that like to have the very latest of everything all the time. As soon as a new version appears we want it, so we download from elsewhere so we don't have to wait for Google to send it to us. Exactly, that is what I would like to know. It is nice there are people out there that take of this. Not a biggie to download though. I have the same tablet, and Im having the same problem, did you fixed it ? Downloaded the newest version all seems to be good. Why doesn't Google push these versions on the play store? Thanks Viswanath for your help I got it sorted and my android is working great cheers! I am trying to uninstall to revert back but unable as no uninstall is possible. You must have downloaded the wrong version. You need to re check your version and re download the correct one. Don't panic it will work ok.
Make sure you have the right version of Google Play services. When a call comes in the answer icon touch/slide function does not answer the call about 30% of the time, and the call is missed. Is this operator error or a malfunctioning feature? The mic stops working when on a call, and mute button is "not" on. The party on the other end of the call stop hearing suddenly, and only when the speaker is turned on can they hear what's being said. Is their a fix? Autorotation on 6 edge is unstable when using camera. Landscape presentation goes 180 degrees out when using camera/video. Turning the device 180 degrees to correct the presentation only works intermittently, all other times the screen turns upside down again. Is there an App or such that stops all the other less used apps from battery flogging that you don't need when your using your main daily apps, without going to physically to Disable them. I have one that just 'Optimizes' but they start up again soon automatically. I have a ZOPO 999 Pro, 4.4.5, with an AN TU TU rating of 47558 ... she really rocks ! Awaiting for your 'knowledgeable' and extensive knowledge ! !